Origin Fitness are delighted to announce that we are now the exclusive distributor of Alpha Strong products for UK, Europe and the Middle East. Alpha Strong Sandbags are way ahead of the curve. They are simple, strong, and made to last! They are the first sandbags on the market that have function driven handles in multiple places for easy handling and versatility. You can do non-traditional moves by not using the handles, or traditional moves like pulls, pushes, lifts, and throws utilising the handles. 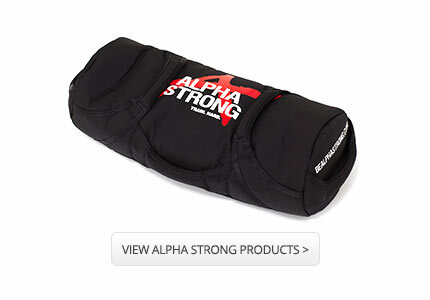 Alpha Strong bags feel like traditional sandbags in that the sand shifts as you move them; this is what they call fighting the bag! Alpha Strong bags are made out of durable fabric that can take punishment. They are constructed to hold up under the most intense exercise regime and were tested in gyms that have used this type of equipment for years with no success in longevity of the equipment. Broken liners, ripped handles, and inferior materials have been a frustration in using this type of tool effectively, but they are no longer an issue with Alpha Strong bags. This entry was posted in Just Launched on 13th May, 2014 by Colin Evans.